Description: Mid-calf boot, felt lined, wide opening allows for easy entry and exit. Description: 100% Nylon, Expandable wrist band and extra thickness. Description: Nylon knit reversible with vinyl criss-crossed coating both sides. 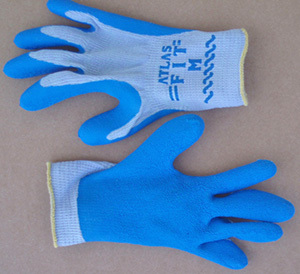 Description: Nylon/Poly heavy duty work glove with tight weave for durability. Description: Natural latex glove. Unlined, rolled cuff, and crinkle finish. Description: Double dipped oyster gloves have soft inside and durable outside. Description: Seamless, shoulder-length, double-dipped nitrile with 100% cotton liner for comfort, featuring amazing flexibility and excellent wet and drip grip. Description: Double dipped oyster gloves for the right handed person. Left hand glove. Description: Insulated grip glove offers a warm quality.Open-back design.Light gray Poly Cotton/Acrylic liner with flexible latex grip palm.